It’s been six long years since the New York Yankees competed in the coveted Fall Classic. 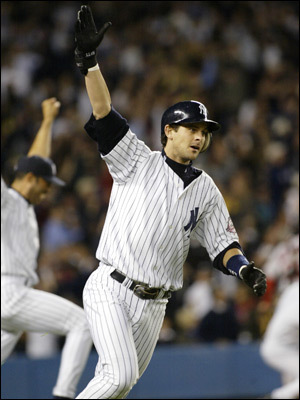 Not since Aaron Boone’s moon shot off Boston’s Tim Wakefield leading off the bottom of the 11th inning in Game 7 of the 2003 ALCS catapulted them into history have the Bronx Bombers played for all the marbles. But stemming from last night’s 5-2 ALCS-clinching win over the visiting Los Angeles Angels of Anaheim, the Yankees are back in the World Series and in search of their 27th championship title. The fast-approaching WS action against the NL Champion Phillies starts Wednesday night at home. Last night’s pennant-clincher in the Bronx started off in partly cloudy, 58-degree weather, mild temps for the Empire State this time of year. Starting pitchers Andy Pettitte (Yanks) and Joe Saunders (Halos) locked into a great pitcher’s duel through three innings. 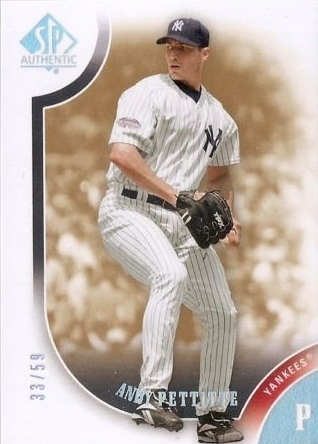 But the wheels started to come off for Saunders in the fourth, as the Yankees – trailing 1-0 at that point – proceeded to load the bases and tallied three runs before the bleeding stopped. Johnny Damon’s two-run single and a bases-loaded walk to A-Rod proved to be the exit plan for Saunders, who had thrown 83 pitches to that point. The game was a great battle throughout as both teams gathered nine hits, but it was the timely hitting by the Yankees, coupled with botched fielding and running by the Angels, that spelled the outcome. Uncharacteristic fielding errors by Anaheim at the most crucial junctures helped the Angels find their golf bags two weeks early. Boneheaded base running by veteran batsman Vladimir Guerrero in the second inning started Anaheim’s demise. After singling off Pettitte to start the inning – the Angels’ first hit – Guerrero watched as Yankee right-fielder Nick Swisher sprinted in to snag Kendry Morales’ sinking liner. The problem was Guerrero was watching this from about 20 feet off first base. He was drifting too far off first and was quickly doubled-up by Swisher’s rocket throw back to first baseman Mark Texeira. This can start to deflate a team, you know? But it was two unbelievable errors in the bottom half of the eighth that did in the Halos. After scoring a run in the top half of the inning off Yankees closer Mariano Rivera to bring them within a run, the Halos – along with the 50,000 fans at Yankee Stadium – could sense a slight momentum shift. The Angels would face Rivera in the top of the ninth with Howie Kendrick, Juan Rivera and pinch-hitter Gary Matthews. But there was something they needed to do first; keep the score close by getting the Yankees out in the bottom half of the eighth. After just-arrived setup man Ervin Santana promptly walked Robinson Cano on four straight pitches to start the eighth, Anaheim manager Mike Scioscia yanked him and went to starter Scott Kazmir to keep the score close. Knowing that the Yankees would try to sacrifice Cano over to second, everybody was playing in, looking for the bunt. Swisher promptly obliged and Angels’ first baseman Kendry Morales fielded the bunt cleanly before firing the ball back up the first base line to second baseman Kendrick, who was covering first. Kendrick must have taken his eye off the ball as it gleaned off his glove, leaving both Cano and Swisher safe at second and first. Two men out, still no outs. Surely the Yanks would try the same ploy to advance the runners. And sure enough, they did. With everybody in the stadium waiting for the bunt up the first base line, Melky Cabrera promptly delivered. Kazmir fielded the ball cleanly but immediately shot-putted an air ball to Kendrick, who was once again covering first on the play. The ball sailed over Kendrick’s outstretched arm, while Cano hustled home with the Yankees’ fourth run. After Derek Jeter grounded back to the pitcher for out No. 1, Damon came up and earned a walk to load the bases. Texeira then delivered a long fly ball to right-center which scored Brett Gardner (pinch-running for Swisher) with another important insurance run. Jered Weaver came in to relieve Kazmir and, after walking A-Rod, got Jorge Posada swinging to end the inning. But the damage was done. Those two errors cost the Angels in a big way. They came back out in the top of the ninth, only this time the score was 5-2, not 3-2. One swing of the bat would not send this game into extras. The damage was done. The Angels knew it and went down in order in the ninth. Matthews ended the game appropriately enough by flailing at a high fastball. The Angels’ mission of destiny – riding on the momentum of their season-long tribute to fallen teammate Nick Adenhart – was over. As for the Yankees, things are just starting to heat up. Let’s see if A-Rod can keep his postseason average above .300 against the Phillies. This scribe has the Yanks winning their 27th title in six games against Philadelphia. In 1950, the last time these two clubs faced one another in the Fall Classic, the Yanks swept the Phillies. It won’t be that lopsided this time around, but the Yanks will prevail. Just wait and see.